This is the one of many topics in the Current Transformer series. This topic is dedicated to introducing current Transformers in very general terms. We shall have, many videos for topics. such as Equivalent CT Circuit, CT Saturation, Sizing CTs for Protection, and Metering, CT polarity, and CT Grounding. For the part 1 of this topic, we shall define Current Transformers and explain its basic operations. We shall also briefly compare CTs, with Power Transformers. In simple words, a current transformer, or a CT, is a type of transformer which converts a high value of current and voltage, into a smaller value of current and voltage. The high value quantity and low value quantity is linearly proportional by the CT turns ratio. Consider an equivalent circuit, of a current Transformer. Current Transformer is a very special application of a step down transformer. In order to have a smaller amount of current on the secondary side of the CT, the number of turns on the secondary side of CT must be high. That’s why we achieve a low value current, on the secondary side of CT.
On the other hand, we have a power transformer, which transfers the power from the High voltage winding, to the low voltage winding or vice versa., in order to get a different combination of voltage or current on either side. Power transformers are generally used in transmission & distribution network for stepping up or stepping down the voltage level. It can be either a Step up transformer or a, step down transformer. Let’s consider a Single Line Diagram, in which the source is connected to the step-up transformer, which transfers the power from the transmission line and then the power is distributed to the facility with the help of a step-down transformer. For a Step up Power Transformer. We can expect the secondary winding turns to be much greater, than the primary winding turns, because its purpose is to step up the voltage on the secondary side. Similarly, for a Step Down Power Transformer. We can expect the secondary winding turns to be much smaller, than the primary winding turns, because its purpose is to step down the voltage on the secondary side. Now Let’s consider; we have a window or donut type CT to have a conductor passing through it. The conductor is considered as the primary winding. And the CT winding itself is considered as the secondary winding. Because the primary winding only passes through the window type CT. 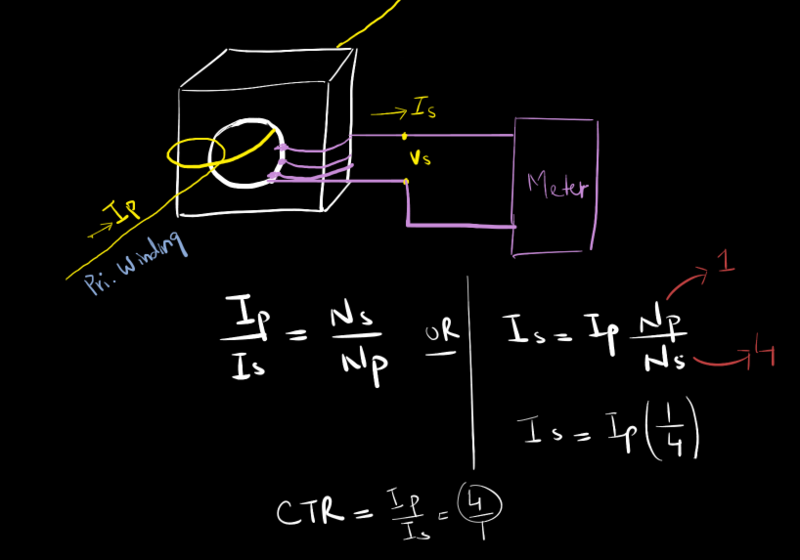 In this particular example, Primary current over Secondary current is equal to the Secondary turns over primary turns. So in this application, the primary current is being stepped down into a small but a proportional quantity. It is proportional by the Current Transformer Ratio, C T R.
Although the use of CTs are wide and varied, they are mainly used for either protection or metering purpose. In order to protect a transmission line, CT can be wired up to a protective relay which monitors current flowing through a transmission or distribution line… or a feeder... If an abnormality occurs, the primary line current would increase, which meant that the secondary current of CT also increased. This increase in current would indicate an abnormality, and the protective relay would issue a tripping command to a circuit breaker. Protection Class Current Transformers, are designed to transform wide range of line current with manageable amount of error. It has to cater a high amount of sort circuit currents. Typical range is 5 to 20 times the load current because short circuit currents can be very high values. We can expect the CT error to be less than 10%... So protection Class CTs should be carefully sized to make sure the CTs do not saturate. Accuracy is not very important in the designing of protection class CT, because it has to handle a high amount of short circuit currents. It is important to remember that the metering Class Current Transformer, must have low saturation value. So metering Class CTs, should be carefully sized to make sure the CTs must saturate, before Fault current. In the next part, we will discuss about the equivalent model and the important characteristics of a current transformer.